HAZWOPER Respiratory Protection Video and DVD Excerpt: Respiratory protection and self contained breathing apparatus are used to protect us from harmful gases. Fumes, vapors, and chemicals as well as where the air doesn't contain enough oxygen to support life. You need information and training on this type of equipment and the hazards involved before you attempt to use respiratory protection. Your organization will provide specific training. But this program is designed to give you some information about personal protection under adverse or hazardous conditions. Let’s begin by talking about the basics of why the protection is needed. We all know that chemicals and hazardous materials may have an adverse affect on your health, but the affect may not show up for years later. after repeated or long term exposure. If you drop something on your foot you know it right away, if you're exposed to a harmful chemical you may, or may not feel the ill affects for a long time if ever. Some chemicals such as chlorine act quickly. So you know about that exposure immediately. Breathing is a natural function and we never usually think about how it happens. Our brain sends messages to the nerves and muscles in the lungs telling them to function. The diaphragm, a large muscle stretched across your abdomen contracts to pull air through the nose down your wind pipe and into the lungs. 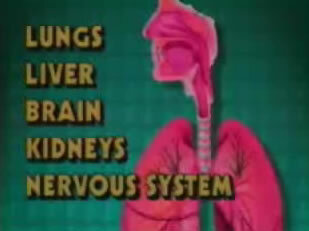 Once in the lungs oxygen migrates into the bloodstream through the thin walls or tiny air sacks deep within the lungs. Breathing toxic chemicals end up in the lungs. Naturally the lungs, liver, brain, kidneys, and central nervous system are all potential targets of many chemicals. Your body has natural defenses such as hair in the nose, tiny hair cells that line the respiratory system, and other similar defenses. They cannot defend against many harsh or dangerous chemicals. One of the problems that we all encounter is dust. Dust can be in the forms of nuisance or hazardous dust. They float in the air and can enter your body through breathing. Skin absorption or through eating or drinking the residue created by the dust. Fumes occur by high heat operations such as; welding, or smelting. Mists are hazards found in operations such as painting or pesticide applications or any area where liquids are set in motion in the air. Gases are usually produced by some chemical process such as hydrogen sulfide found in sewers or storm drains. Carbon monoxide gas is usually a by-product of engine exhaust. Some of these gases have odors, some do not. Hydrogen sulfide smells like rotten eggs. Carbon monoxide is odorless and has no color. Vapors are the products of volatile liquids giving off vapors such as gasoline, paint, or solvents. There is still another hazard; oxygen deficiency. Oxygen deficiency is simply a lack of oxygen in the area you are working such as confined spaces. Protection from respiratory hazards requires the joint cooperation from both you and your employer. The employer has the responsibility to determine the hazards of the job, and reduce or eliminate the hazard as much as possible. The employer also provides the respiratory protection program. You have the responsibility to follow your company's policy and procedures.